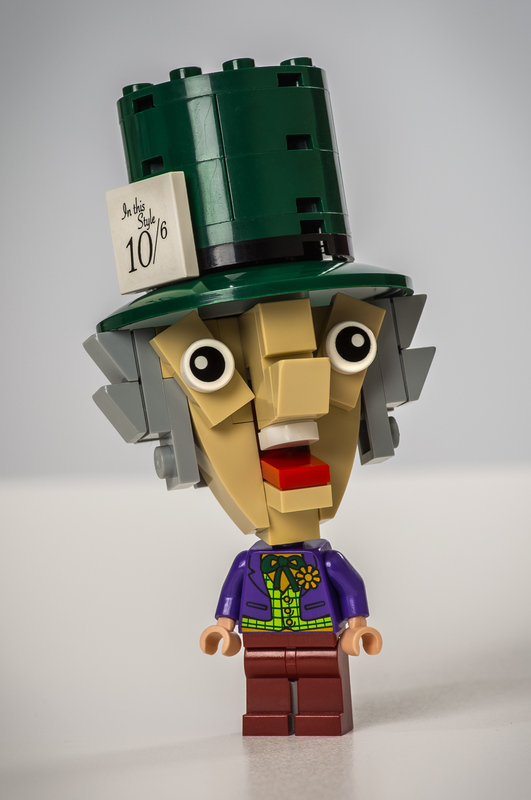 In my forthcoming stop-motion animation Alice in Wonderland parody, this will be the character for the Hatter. I had limitations with certain minifig parts, so I managed to circumnavigate this obstacle by creating custom oversized bobble heads on minifig bodies: the heads can open and close their mouths like dummies or puppets. I think this adds more to the humor of the video, rather than just superimposing animated mouths over minifig heads. The 10/6 price tag on his hat was created with a custom waterslide decal, and then I attached the white tile to the hat with some washable glue. I rarely ever glue LEGO pieces together, and if I do, I use glue that can be removed without damaging the plastic.